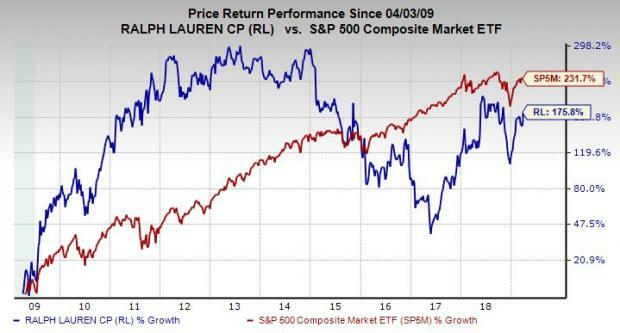 Ralph Lauren (RL) shares have surged 25% this year to outpace the apparel market’s roughly 16% climb and the S&P 500’s 12% gains. The luxury fashion brand posted stronger-than-expected holiday quarter results and has seen analysts turn more bullish recently in terms of RL’s bottom-line expansion. Ralph Lauren has long been a powerhouse of more attainable high-end fashion, unlike say Gucci or Saint Laurent, which are owned by Kering SA (PPRUY). On top of Ralph Lauren’s namesake brands, the company owns Club Monaco. The brand competes against the likes of Walmart (WMT)-owned Bonobos. Meanwhile, RL raised its marketing investment by 18% last quarter to help drive brand awareness and attract younger customers, who have been won over by the likes of Lululemon (LULU) and Canada Goose (GOOS). Part of Ralph Lauren’s push focuses on e-commerce, including social media. RL has boosted its following on quickly expanding Instagram (FB), where brands are now built and people shop directly, to over 10 million on its core page alone. These efforts helped the company post 20% digital revenue growth last quarter. RL’s digital comps soared 62% in Asia and 21% in North America during Q3 fiscal 2019, which included the vital holiday shopping period. The New York-based fashion giant’s moves helped the company’s quarterly earnings pop over 14% to $2.32 per share and top our quarterly Zacks Consensus Estimate, on the back of 5% revenue growth.